Once we got back to the gate after leaving the lounge, boarding had already begun. 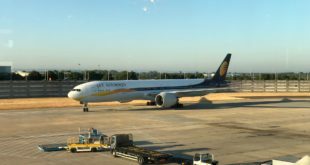 When we boarded approximately quarter of the aircraft was remaining for boarding. 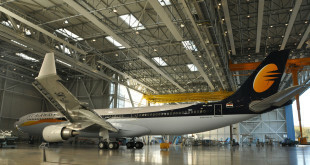 BA119. STD 14.20 STA 04.45 +1. All times local. 9-May-2018. Upon boarding the aircraft, I was pointed to my seat. 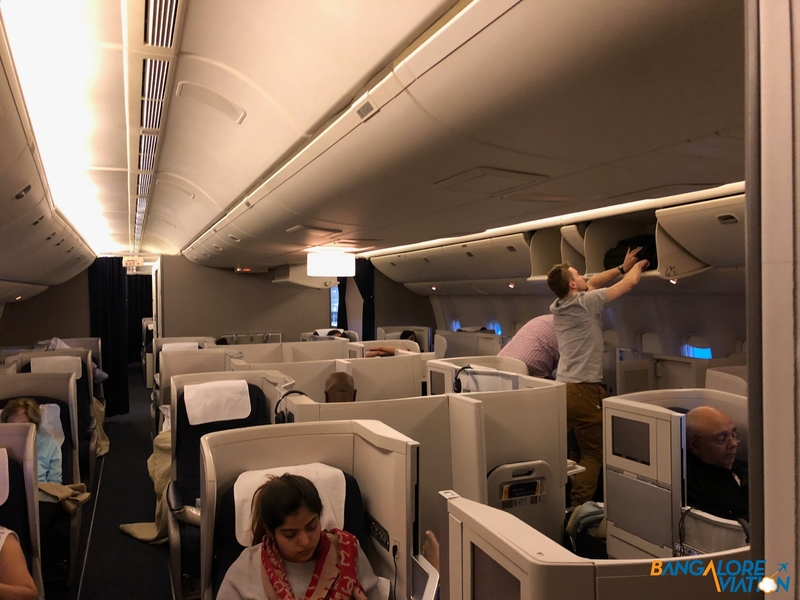 Unfortunately because we were among the last to board in business class and how dense BA’s configuration is, most of the bins were already full. 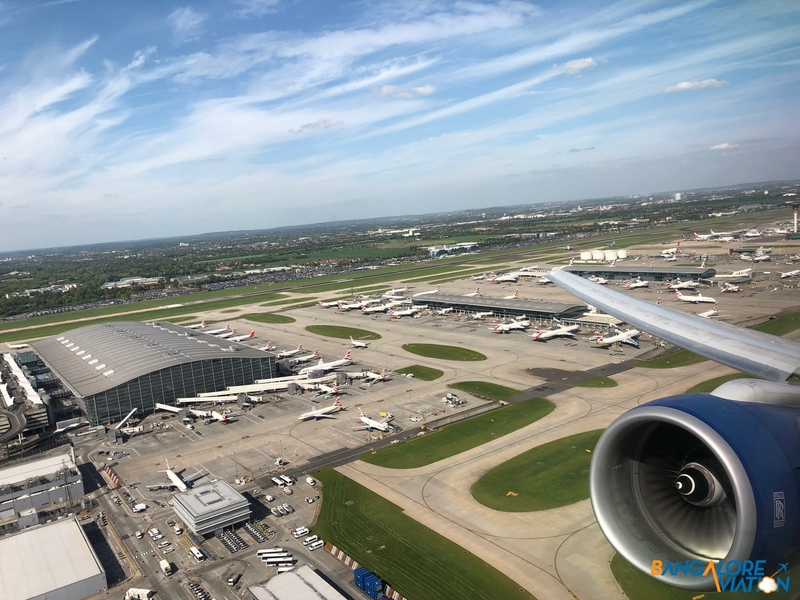 I found a bin a few seats down from me and stowed my bag – unfortunately I could see the person whose seat was under the bin and had boarded after me, hunting around the aircraft for space. 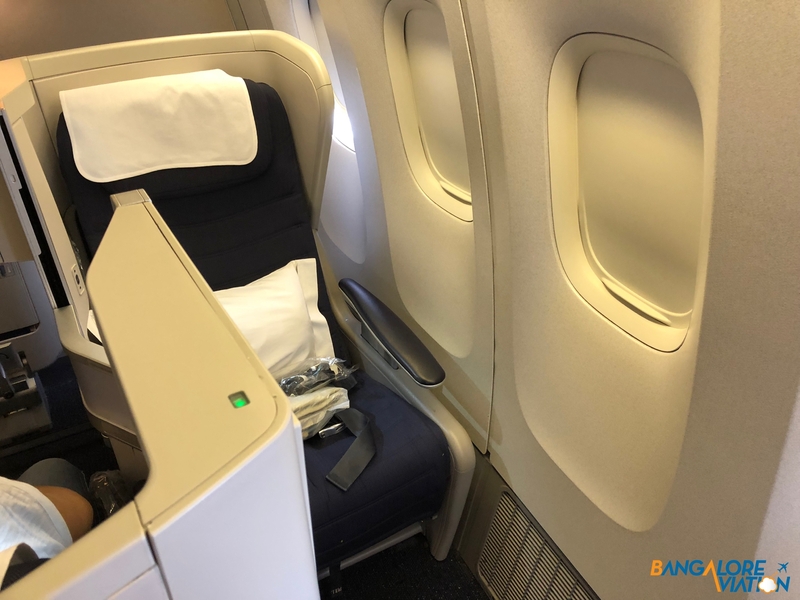 Seat 2K on British Airways 777-200. The regular headphones, blanket and menu were already in my seat. 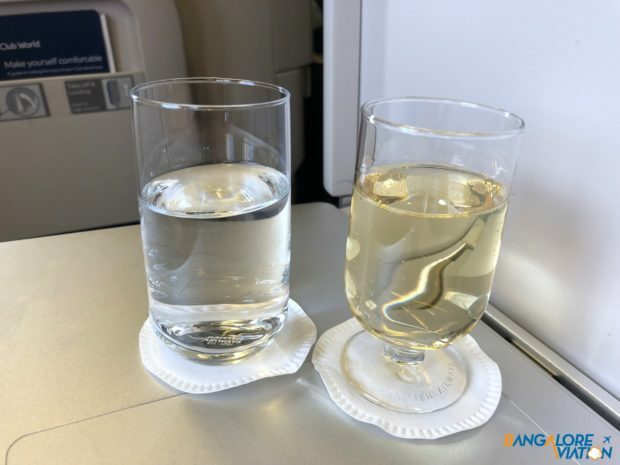 As soon as I took my seat I was offered a drink – I asked for a glass of champagne and water. As I was settling down, one of the crew came by and gave me an amenity kit. 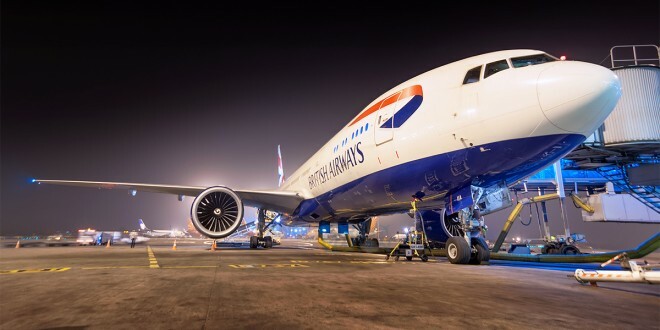 BA uses a dense 2-4-2 front-back configuration on it’s 777’s. The A, E, F and K seats are rear-facing while the remaining seats are forward facing. The seats on the 777 are virtually identical to the 787 product we flew earlier. It is a really old lie flat seat which is 20 inches wide. 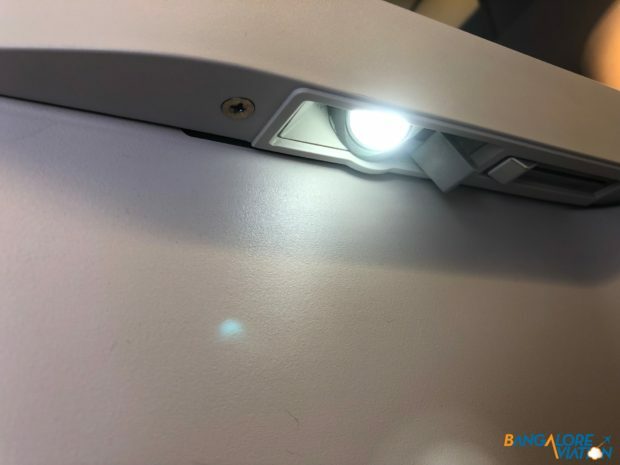 The only storage available in the seat is a single drawer that can only be accessed when the seat is in the upright position. The footrest of the seat must be manually lowered and put back in the folded position. 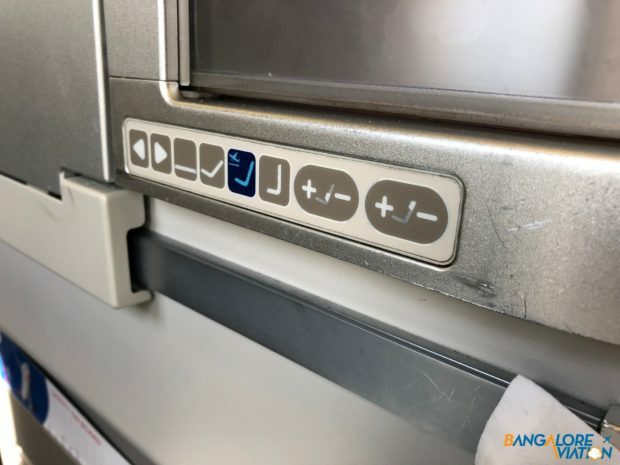 The arrangement of the seats makes it so that you cannot get out of the window without hopping over the feet of the seat behind you. It is also set up in a way that has you looking right at the face of the person in the seat next to you until the partition is put up. When the seat is upright there is a massive amount of room in front of the seat. 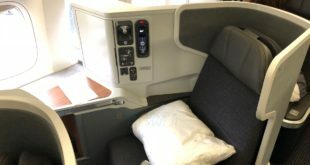 Compared to our previous flight on BA, the cabin was far cleaner however it still wasn’t up to the standard of the eastern or even American carriers. Unfortunately the IFE screens on the 777 are even smaller than the ones on the 787’s and are really low resolution. The interface was also slow and clunky but it appeared there was an ok selection of content on the system. I used my own device during the flight, so I didn’t explore the IFE much further. 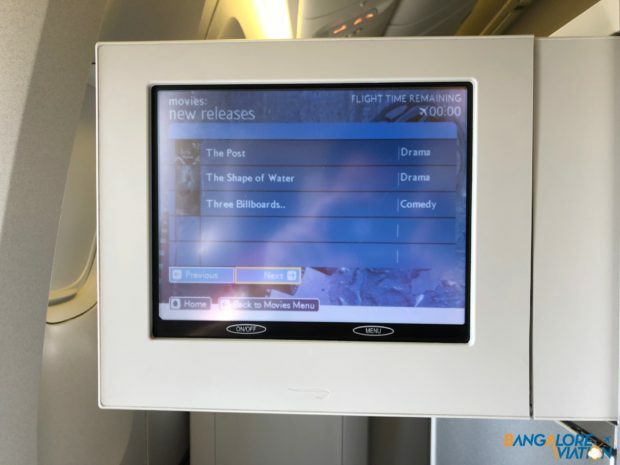 The IFE screen on British Airways 777-200. 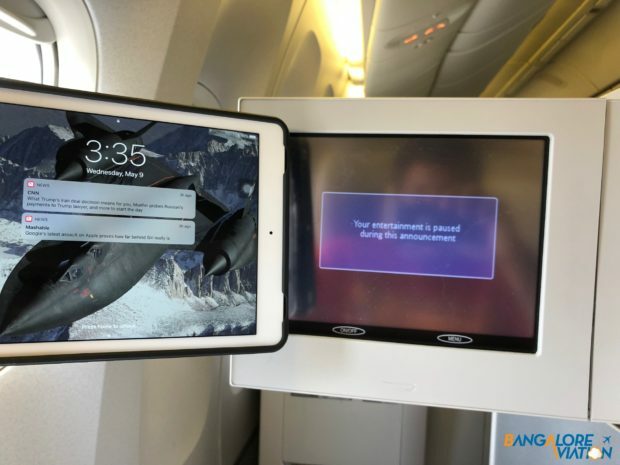 The IFE screen on British Airways 777-200 compared to a standard iPad. As the aircraft pushed back, the crew came about and opened all the IFE screens for the safety briefing. Following which they came back around and made sure all the screens were closed. The flight finally took off just under two hours behind schedule. Soon after takeoff, the crew began a drink service. The crew on this leg seemed particularly cheerful and the steward insisted I try one of their cocktails instead of just a plain drink. I finally agreed and he made me a Buck’s Fizz which I really liked. The drink was served with a pack of roasted nuts. 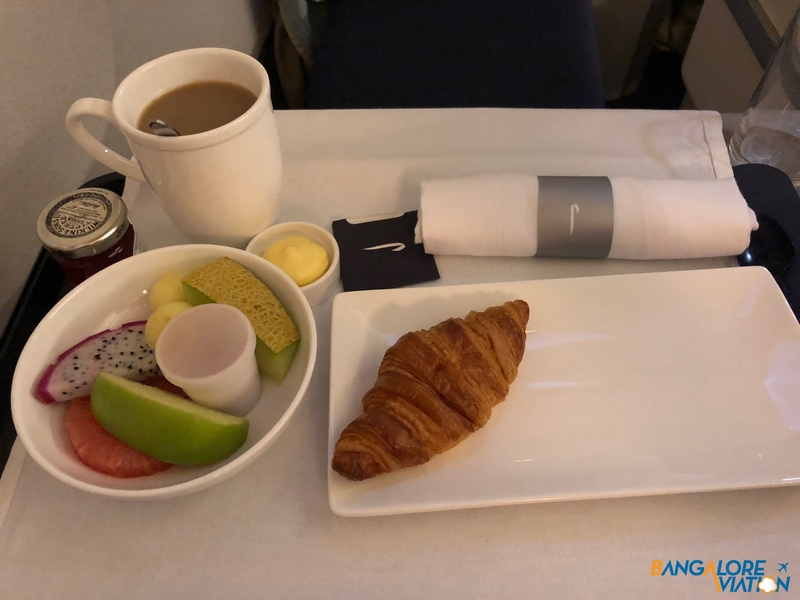 About an hour into the flight, the lunch service began. For an appetizer I was forced into the Dokhla vegetarian option since the other option was seafood. The appetizer wasn’t very good and the salad was ok.
For the main, I had ordered the chicken which was good and for desert a custard tart which was decent. The meal service was conduced efficiently and service throughout was good. The crew also kept refilling my drink and water without prompting. After the meal, I caught a few hours of sleep. When I woke up, I was feeling a bit hungry, so I got a couple of snacks from the snack point near the galley. I really like the snack bar on BA – it’s like a kids paradise. It is filled with ice cream, chocolates, chips, popcorn, etc. There is also some fruit and stuff. After grabbing my goodies – I watched some TV on my tablet. About an hour and a half before landing the breakfast service began which was good. The rest of the flight proceeded uneventfully and we landed about an hour and fifteen minutes behind schedule. 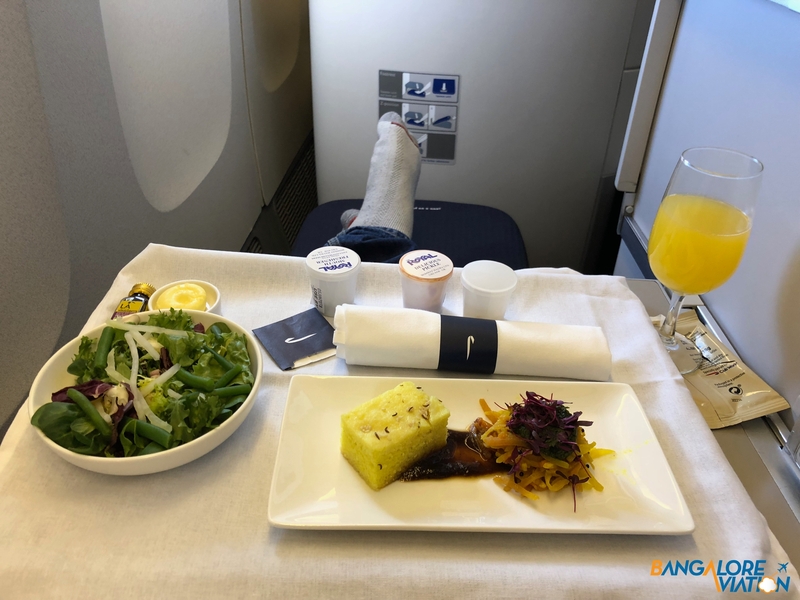 I found this flight to be quite decent – service was definitely miles ahead of my previous flight with BA. The cabin product was still a let down, hopefully with the new product BA is introducing next year there should be an improvement. More reviews from this trip.